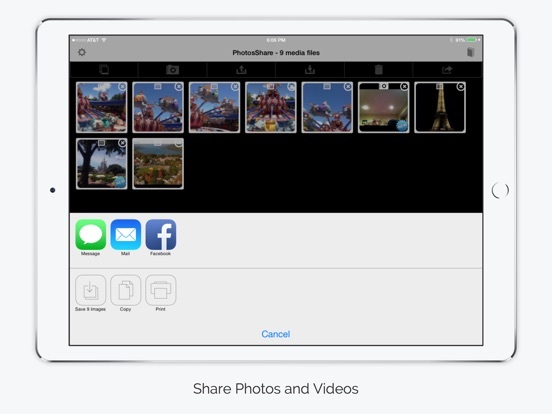 Wirelessly share any size photos and videos from one iPhone or iPad to another. 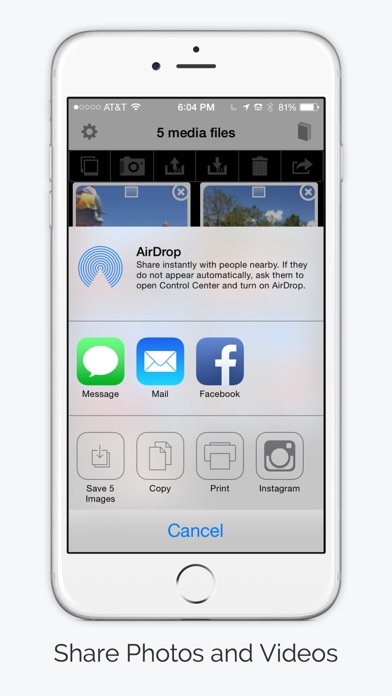 You can also share using services such as Facebook, Twitter, Instagram, iMessage, Mail, Clipboard, iCloud Photo Sharing, Evernote, Instagram or even print using your printer, . Transfer full resolution photos and videos painlessly or use photo quality setting to adjust media size. New media is marked with a new icon for easy selection and number of new media is indicated. Can select from photos and videos, photos only and videos only. Also marks new photos an videos. Photos and video transferred in full resolution and shared using device Bluetooth so sharing can be done from anywhere. Can also upload to other services such as Facebook, Twitter, iMessage, Mail, Clipboard, iCloud Photo Sharing, Evernote, Instagram and more depending on the apps you have installed. Even print, if desired. Photo quality settings available are good, better and best. Best provides the original image resolution. 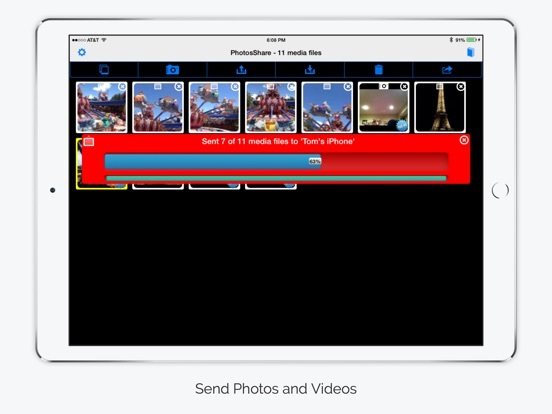 Just select the photos and videos that you want to share then click Send Media to start the process. To receive the media on the other device install and run PhotosShare on that device and click Receive Media. 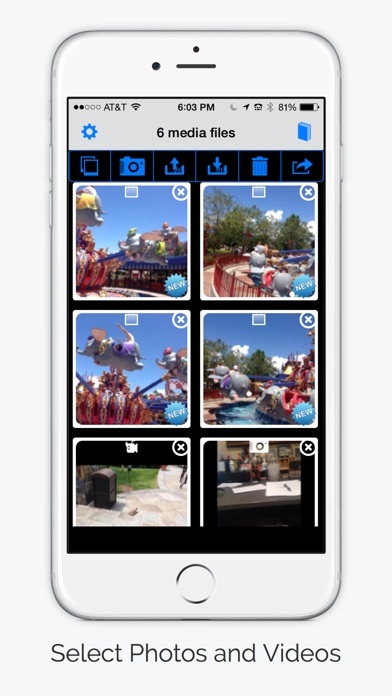 You can choose to select from photos and videos, photos only or videos only. Indicates which photos and videos are new. New media is from today, yesterday or the day before yesterday. 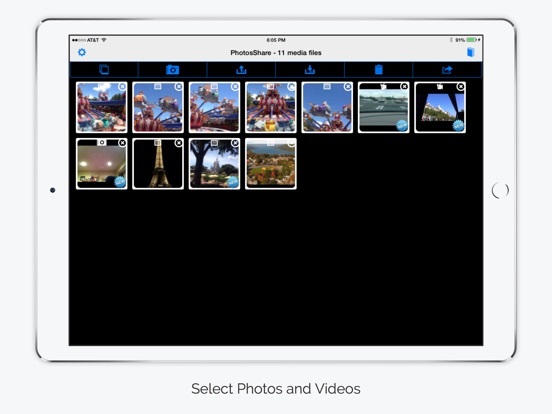 The number of new photos and videos is also shown along with the total number of photos and videos. Clicking the thumbnail image for a photo or video will toggle between full-screen and the original image. 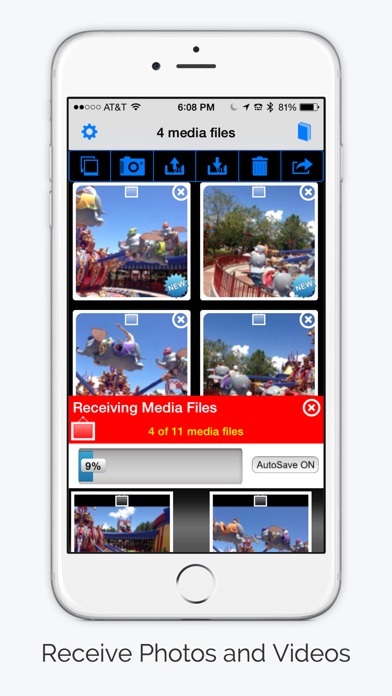 Easily remove any photo or video from your selections. A photo icon indicates a photo, a video camera icon indicates a video and a camera icon indicates that the photo was taken by the camera. Click the print icon to print using AirPrint. Use in app settings to quickly access and change your settings. Use Display Name Settings to change the name to display to other PhotosShare users. Use Send Options Settings to set the maximum photos that can be sent at a time, thumbnail size, send packet size, photo quality and to turn sound on and off. Use Receive Options Settings to turn on or off automatically adding of media to your Photos collection and to turn sound on or off. 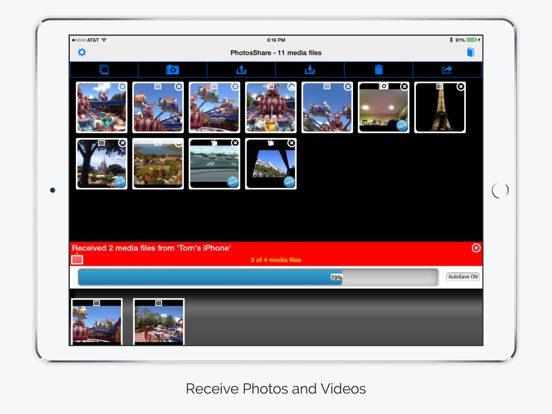 The default is to automatically add the transferred media to your Photos collection. 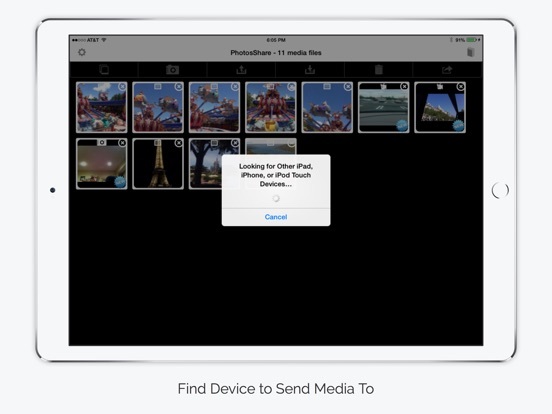 If you just want to transfer and view media between devices then turning this off could be beneficial. When receiving media, this setting is reflected via the AutoSave option. Sharing uses the Bluetooth (device to device) which provides a range of up to 30 feet for sharing with friends or other device you have. Sharing can be done whether you have a network present or not.